Bliss Floral Design is a home based floral studio in Stafford on the northside of Brisbane, specialising in Brisbane wedding flowers and special events. As specialist wedding florist Karen at Bliss Floral Design uses the finest fresh flowers to create contemporary, elegant and innovative designs. Karen established Bliss Floral Design in 2000, she has considerable experience in the Brisbane wedding industry. Karen has designed wedding flowers for hundreds of happy brides and designed flowers for most of Brisbane�s best churches, ceremony sites and reception venues including Victoria Golf Club, Hillstone St Lucia, Stamford Plaza, The Marriott, Royal on the Park, Bretts Wharf, The Landing at Dockside, Customs House, Sirromet and Glengariff just to name a few. As Karen works from a home based studio we can arrange appointment times to suit you. If you are organising your Brisbane wedding from interstate or overseas we are more than happy to do this via email, phone or skype. Bliss Floral Design guarantees that your wedding flowers will have polish and quality that is unsurpassed. 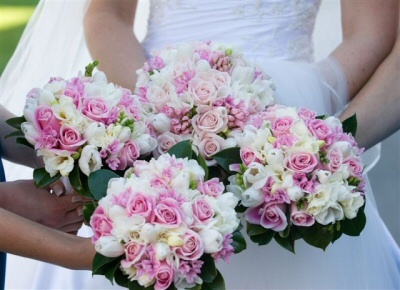 We understand how important wedding flowers are to the success of your wedding day. Please contact Karen at Bliss Floral Design to organise your obligation free consultation at her Brisbane florist studio, to design your perfect wedding flowers.